All MD9200 series products deliver bandwidth efficiency while maintaining signal integrity and visual quality. Both decoders optimize 1080P AVC (H.264) and 1080i MPEG-2 compression, with optional support for very high bit-rate 2160P HEVC (H265) UHD streams. When using the OpenGear decoder (MD9200-DEC-OG), customers can house up to 20 decoding modules in a single 2RU openGear chassis for high-density signal de-compression to SDI and HDMI. The standalone MD9200-DEC delivers the same operational benefits and visual quality for point-to-point streaming. 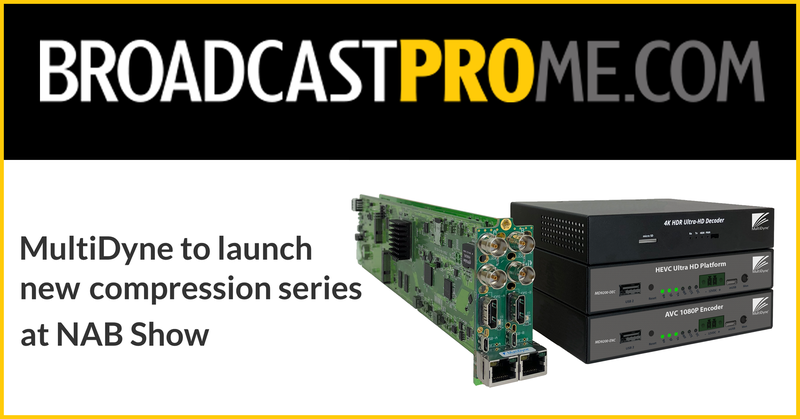 The MD9200 series promise exceptional value in IP-based contribution applications for news, sports and studio links, according to Jesse Foster, MultiDyne’s Director of Product Development and Western Region Sales. Foster also sees the opportunity for MultiDyne to provide value to content delivery and digital signage networks, with support for CDN transcoding, on-demand playback, and 4K/UHD content looping among other applications.